The loss to the Pittsburgh Steelers on Thanksgiving left the playoff hopes of the Indianapolis Colts dangling from a very thin thread. When the Tennessee Titans lost to the Colts the week before, their playoff hopes were looking bleak. What they both need to keep their playoff hopes alive–besides winning a few games—is for the Houston Texans to lose. 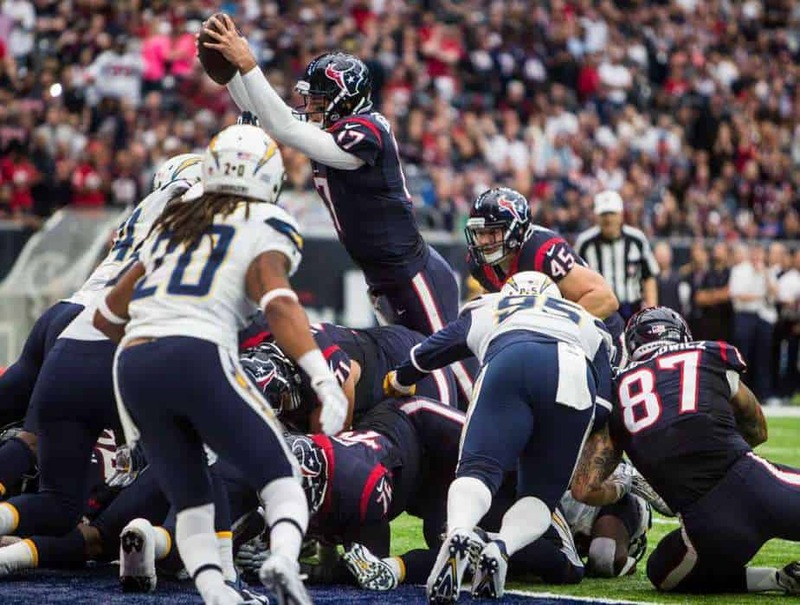 Thanks to the San Diego Chargers, the Texans did just that Sunday. Houston fans were probably hoping that Brock Osweiler might find some temporary relief from his struggles playing against one of the worst pass defenses in the league. They hoped Lamar Miller would find success going up against the weak Chargers run defense. They may have even felt like their team would score a few points. But they were left disappointed. Things didn’t start off too badly. After punting on the first two drives, Osweiler guided the Texans on a nice 10 play, 72-yard drive that ended when he dove over the top of the pile for a touchdown. But the good times pretty much ended there for the Texans. On Houston’s next possession Osweiler threw what would be his first of three interceptions on the day. Five plays later, Phillip Rivers connected with Tyrell Williams in the end zone from 21-yards out to give the Chargers a 14-7 lead. 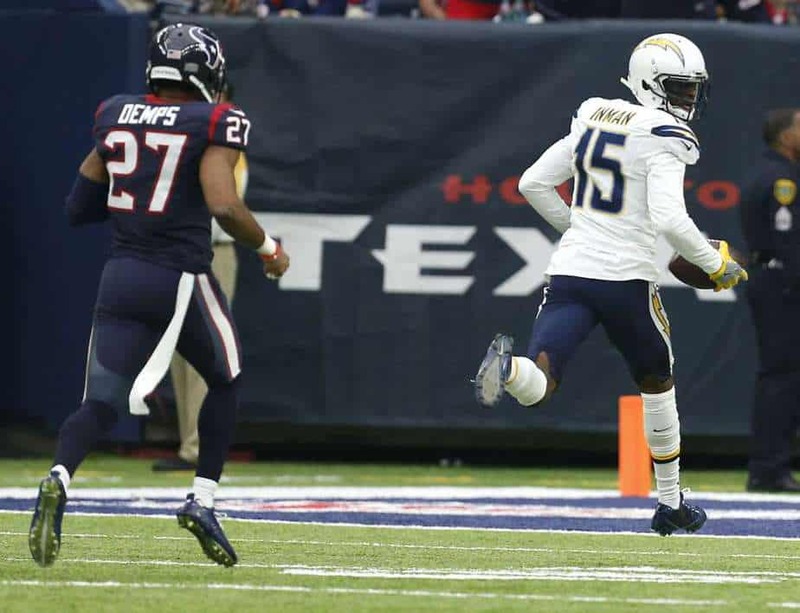 Rivers was kind enough to return the favor with an interception late in the third quarter, but the Texans were only able to get as close as the San Diego two-yard line. Rather than go for it, he opted for points and narrowed the gap to 14-10. But San Diego extended the lead out to 11 with a Rivers pass to Hunter Henry for a touchdown from 12-yards out. With less than 10 minutes left on the game clock, the Texans couldn’t afford any more mistakes if they were going to have a chance at getting back in the game. Two plays into the next drive Osweiler threw another interception. Once again, the defense did its job and forced a three and out, but then the offense fizzled on the next drive (turnover on downs). The defense held tough again, but when the Texans got the ball back, there was just 2:17 on the clock and they were down by 11. Then the craziest thing happened—the Texans actually made it interesting. They needed a field goal and a touchdown (with a two-point conversion). So, rather than kill the clock while trying to get in the end zone and then kick a field goal, they opted to go for the kick once they got within range—which they made—and then go for the onside kick attempt. Before the attempt, there had only been three successful onside kicks in the NFL all season. Now there’s been four. With 14 seconds on the clock and the ball at the San Diego 41-yard line, Osweiler had time for two Hail Mary attempts—which was when Osweiler threw interception No. 3. He ended up going 22 for 37 on the day for 246 yards and the three interceptions. Lamar Miller had his worst day in the month of November with 57 yards on 19 carries and a key fumble in the second half. Head coach Bill O’Brien talked about the need to cut down on turnovers and said that the focus leading up to next week’s game again the Packers would be correcting mistakes, but wouldn’t say if replacing Brock Osweiler was one of them. With the loss, the Texans record fell to 6-5, but are still in first in the AFC South. However, the margin for error has disappeared with the Titans nipping at their heels after improving to 6-6 with a win over Chicago. At 5-6, there are plenty of scenarios where the Colts could get back in as well.